There's always a need to have Thank You greeting cards on hand. Sometimes it's a specific reason like, a baby shower, wedding, or Birthday. There's also plenty of people in my life, including myself that love stationary! I especially love things that are personalized and scream "me". 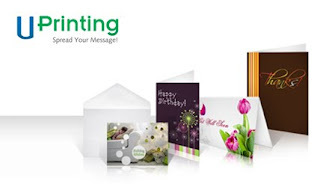 Uprinting.com even offers envelope printing to match your letterhead if you like. If you would like to check them out, you can find them on Yelp. You can find reviews, physical location, and hours of operation. You can win one set of 50 custom thank you cards with plain envelopes! Please tell me what you plan on doing with these cards? Do you plan on giving them as a gift, putting a custom logo on them, etc? Contest is open to U.S. residents only. Contest will end November 14Th, 2009 at 11:59 PM Arizona time. My husband just opened a new business and I'd love to use these to thank everyone who helped get it started. Id like to do them for the holidays for all the teachers,aides and instructors at my daughters school. Thanks for the chance. I'd get teacher thank you cards to give when someone donates to my classroom, volunteers etc. I would use them for my thank you cards for my business. I would use them to send out thank yous for Christmas! Thanks for the contest! I plan on making these custom cards with my son in the design and then using them for his up coming birthday as thank yous for his gifts! I entered your twilight dress giveaway. Id give them to my daughter, she is expecting a baby & these thank you cards would be a big help. I would use them to thank people for coming out to my graduation. I would use them to thank everyone who has been supportive to me during my battle with cancer. I plan on using them for an upcoming birthday!